First Line: "Livie, I think You're completely fucked up." Review:I loved Ten Tiny Breaths which was the first installment to this series and I couldn't wait to get my hands on Livie's story since I loved her so much in the first book but it is so frustrating to have to admit this I had a love hate relationship with her character which made me not love the book as much as I wanted to. First off I love K.A. Tucker as an author and the writing was amazing as expected from her but I couldn't love it because of the actions and thoughtlessness of the two main characters. I'm not for cheating and both Livie and Ashton had a huge problem with it. Livie was with another guy while constantly cheating on him with Ashton and well Ashton had a girlfriend but he was a straight up man whore and there are reasons given on why he sleeps around to redeem his character but I still felt it was selfish. I loved that all the chracters from TTB were brought back in at some point in the book and I absolutely loved it when it was just Kacey and Livie the banter between the two had me laughing quite a few times. There was also a lot of Dr. Stayner and i'm pretty sure in real life no therapist would agree to any of his methods but it was still fun reading about the things he put Livie up to. Takeaway all the cheating...Livie did grow as a character. She went into college thinking she had to be perfect all the time and that she had to stick to the path that she had pre-planned for herself since she was a kid because that is what her father wanted but she soon discovers that life is all about trial and error and everything she thought she wanted...well it just might not be what she wants after all. She grew a lot, made a lot of self discoveries about herself and learned that it was okay not to be perfect all the time. 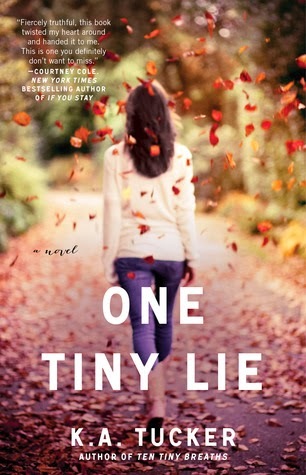 Overall I didn't love One Tiny Lie and Livie's story was in no way close to the gut wrenching story we had in TTB but I still liked it for the most part. Memorable Quotes:~ Sometimes in life you make a decision and you find yourself questioning it. A lot. You don't regret it, exactly. You know that you probably made the right choice and that you're probably better off for it. But you do spend a lot of time wondering what the hell you were thinking.